Every win counts as the Turkey Valley boys’ basketball team (15-4, 12-2 UIC) remains on the hunt for the piece of the Upper Iowa Conference title, picking up another “W” Monday night. Going to Monona to face MFL MarMac (10-8, 10-4 UIC), the Trojans worked to put the game away early in the 64-59 victory. TV outscored the Bulldogs 13-8 after eight minutes and took a 26-19 halftime advantage. “We played in front of a great atmosphere and it was a great game. Early on we were feeding the post well but we had a hard time grabbing the ball and it cost us some easy baskets. We were very active in our defense in the first quarter and contested shots well. I was very pleased at how well we doubled down on the post and made them kick it out,” said Coach Chris Sullivan. The second half saw MFL MarMac chip away at the lead as its offense caught fire, hitting four treys in four possessions of the basketball, taking a lead in the fourth quarter. “The kids did a great job of listening during timeouts and we made some adjustments to try to get them out of rhythm,” explained Sullivan. Trailing by six, the Trojans gathered steam and regained a three-point lead with 20 seconds remaining. The Bulldogs ran a double screen looking for a trey with Elliot Dietzenbach in the kid’s hip pocket and contested the shooter’s step-back perfectly. Hauling in the rebound, Ethan Leibold was fouled and knocked down two clutch free throws to secure the win. The Trojans had four players in double figures. Leibold produced 21 points, with 13 rebounds. Eli Nymeyer and Eli Reicks poured in 11 points apiece, while Garrett Kurtenbach came off the pine to drop in 10. Under the basket, Jason Herold and Simon Schmitt found the basketball for five and four rebounds, respectively. Tuesday’s UIC road contest at Clayton Ridge was postponed due to icy conditions and will be played Saturday, Feb. 9, at 2 p.m. 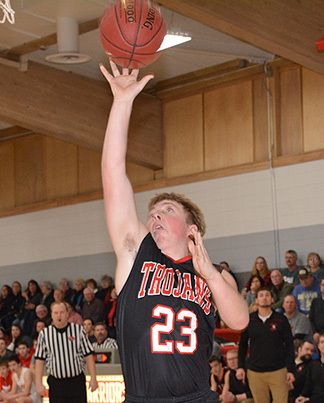 The Trojans will host its final regular season game Friday, Feb. 8, at 6:15 p.m. in Jackson Junction versus Postville.